When my first book was ready for launch five years back, I was under the impression that there will be so much demand for the same, that the publisher will have to do a second print run within a day of the launch. Well, nothing like that happened. The second run did come, but not as expected. I had come out of the comfort zone of my shy self and had attempted to tell all my friends and family about the book. I thought that all of them would buy it. Later when I met some of them socially at their homes, I often looked at their bookshelves to spot my book. When I could not see it, I assumed that they must have a secret bookshelf for special books. How wrong I was! There is a bunch who did buy my book, having got fed up with my reminders. When I raised the topic of the book with them, their answers told me that they had not read the book. So, book buyers can be a different category from book readers. Well, this is not to complain. All are not readers. Maybe they do not have time with all the jugglery around kids, spouses and work. Maybe they like murder mysteries and love stories and I write non-fiction. After all, how can I expect to force down my thoughts down someone’s throats. It has to mean something to them. But here is the point; whatever one thinks it is like after publishing a book, reality is something else. 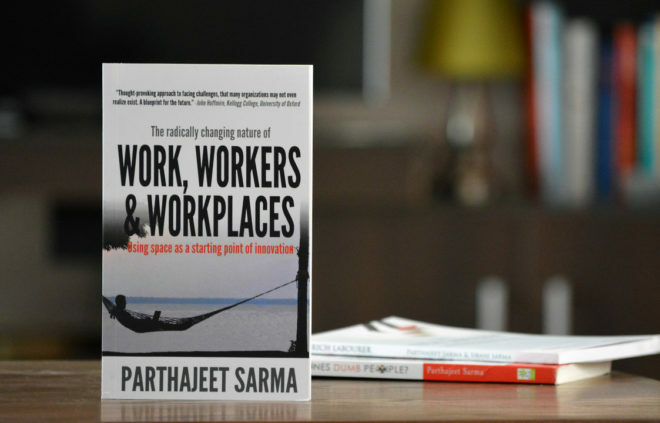 As I prepare for the launch of my third book, The radically changing nature of Work, Workers & Workplaces, my expectations are far different from earlier. At a meet-up with friends last week, when I announced that my new book was being shortly launched, a friend asked me to get along some copies the next time we met. No sorry my friend, I will not do that. I no more like the idea of showing up like an ice-cream man going from table to table, looking for buyers. That is kind of passive-aggressive and the benefit of one more sale is not worth the effort of carrying the books and negotiating a discount worth no more than the price of a burger. Publishing a book is nothing like the fireworks and the parade at Disneyland. However if you set your expectations right, there will be many surprises. You will be surprised by those who buy; people you never imagined would. Five years after the launch of my first book, an old friend recently posted an image of my first book on Facebook saying she was proud to see it in an up-market book store, during a business trip to a new city. The Managing Director of a multinational corporation and a reader of my book wrote me a very touching email, saying that he is very happy to know people like me who have the courage to follow their dreams. He encouraged me to keep writing. A professor from college turned up at one of my book events, uninvited, when he heard about it on Facebook. It brought tears to my eyes. I cherish these moments and those friends and family members who have blind faith in me always; or some of the time. It takes a lot to support the seemingly strange thing that I do besides ‘regular work’. It is an investment of their time and money to find out where they can get my book, get it, read it and even post on social media. Some will buy, some will not. But I have realized that the value and the internal happiness does not come from someone’s validation as much as it does from the love and energy one puts into it. Nowadays I only do those things that I love doing. If I can continue doing that, nothing else matters.